Now that our guest bathroom is up and running, our mudroom is well under way and Josh plans to begin the guest room soon, it's time to begin planning our master bath. 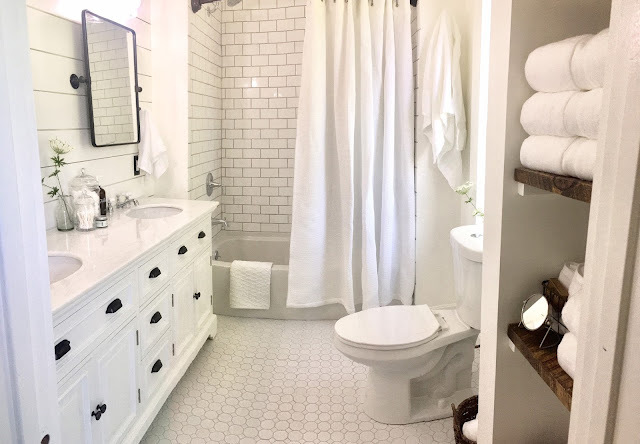 This was actually the project I wanted to start after we painted our kitchen cabinets shortly after we moved in, but we realized we wouldn't have a shower in the house while renovating this room unless we installed our guest bath first. And, well, you know the rest. I'm actually glad we've waited a while to begin this project. 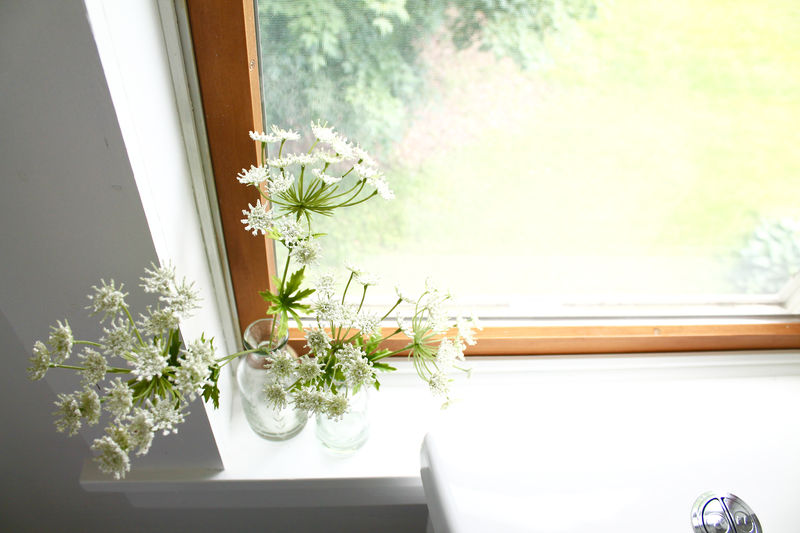 I've had so many versions of this space designed in my head, and while I love them all, my plans for this bathroom have changed a lot from my original vision. Well, I should re-phrase. The general layout has stayed the same, but the overall aesthetic has gone through a few revisions in my head. 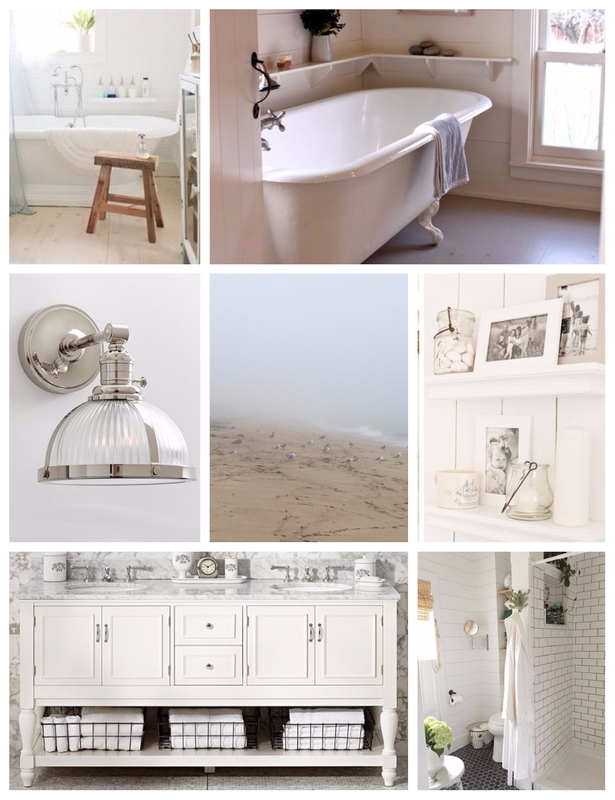 At first, I wanted a light, light (almost white) mint green on the upper walls, a white waincotting on the lower half of the wall, and overall, more of an upscale hotel bathroom feel. Now, guess what? 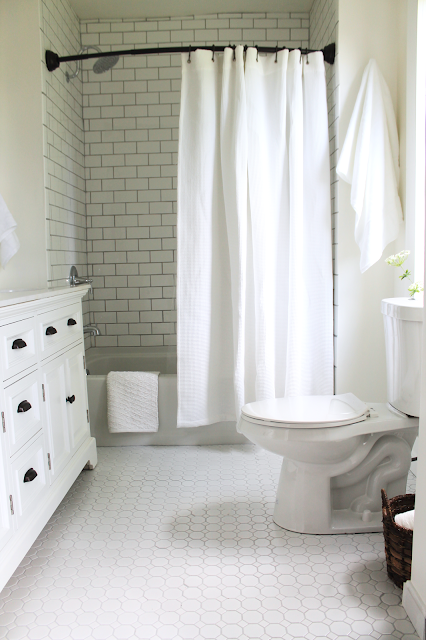 An all white bathroom (surprise! 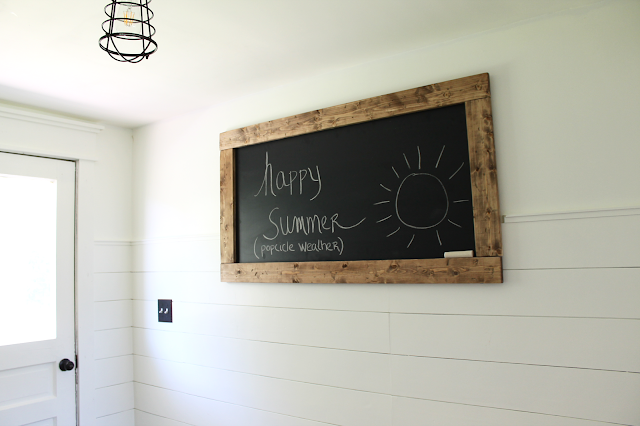 ), with a shiplap half wall and a cottagey undertone mixed with a bit of seaside. 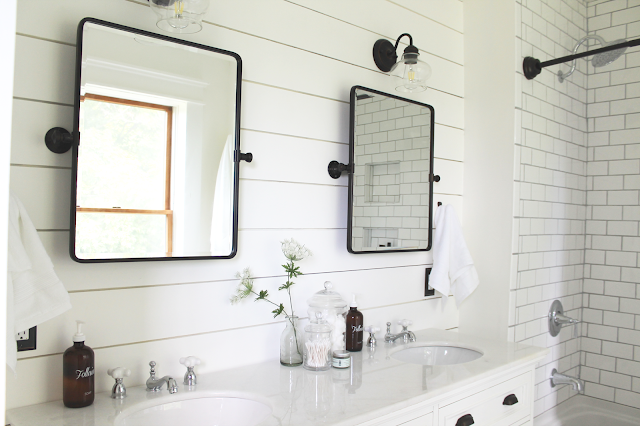 How does one pull off a farmhouse/seaside cottage bathroom? I'm not entirely sure, but the picture exists in my head, and I'm really excited about it. I was actually kind of inspired by a photo I took in Martha's Vineyard last September (the foggy beach photo with the seagulls in the collage above). I just snapped it with my iPhone really quick as the fog set in on a beautiful day at South Beach on the island, and every time I look at it, I just feel so relaxed. And that's how I want Josh and I to feel in this bathroom. It's also how I wanted our bedroom to feel, too, so it's nice that the two spaces, which are connected, go hand in hand. We plan to start this project in the late fall or right after the New Year (it'll probably be after the New Year because, let's face it, that guest room will take way longer than we think). We have to rip everything down to the studs, and have a contractor install a new plumbing line for a free-standing pedestal tub. Then, build the whole thing back up. 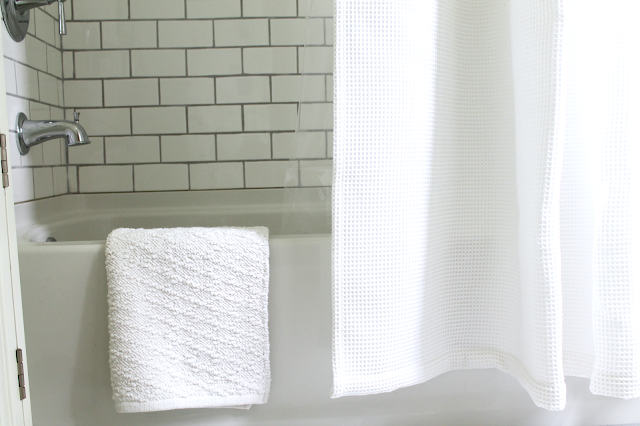 - A walk-in shower with a glass door, white subway tile, and downsize to one shower head (currently, there are two, and we've never touched the second one). 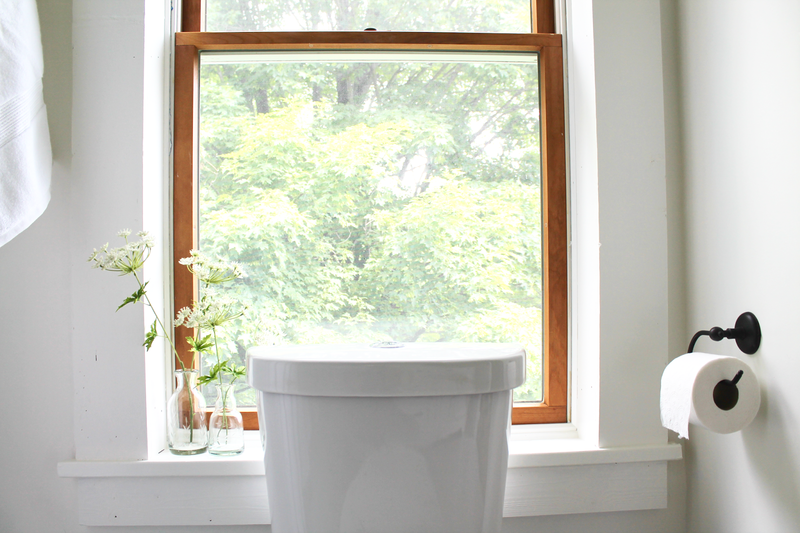 - Free standing tub. To be honest, I haven't yet decided what style I want yet (and I say I because Josh has declared he will maybe use the tub twice in his lifetime). I've gone back and forth a lot, and I've ruled out clawfoot (as much as I adore them, I don't think it'll fit with the style I'm going for). Right now I'm leaning slipper, but I'm also really drawn to a simple pedestal style. - Hexagon tile on the floor, possibly the same we used in the guest bath because it came out better than I thought it would. I was originally thinking a hexagon marble with lots of gray tones, but I actually want to keep it a little more casual, and less upscale hotel). 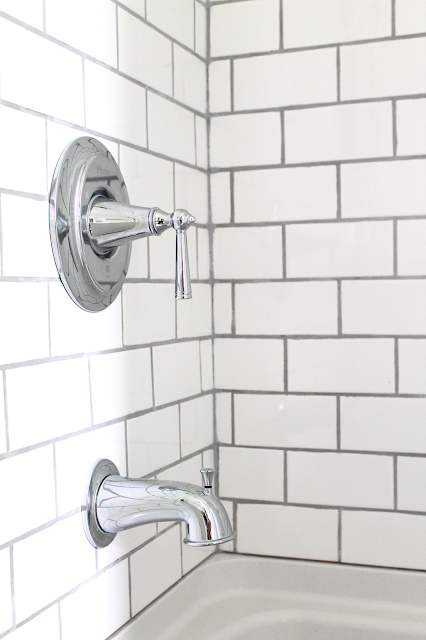 Also, light gray grout. Because grout color is something I never want to overthink again. - Double vanity with an open shelf at the bottom. The bathroom is a good size, but adding the tub will close it up a bit. So we definitely need to add open storage whenever possible to keep the room from closing in on us. 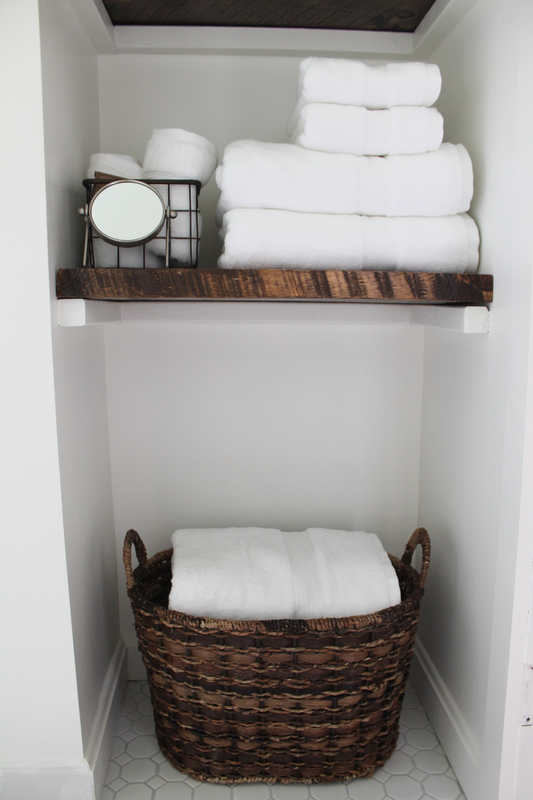 - A wrap-around shelf that will go along the bath tub wall. I actually cannot wait to install this because it'll up the cozy factory in this room by ... a lot. Still deciding if I want to stain the wood or paint it white. I'm leaning white. - Vanity mirrors in lieu of medicine cabinets. 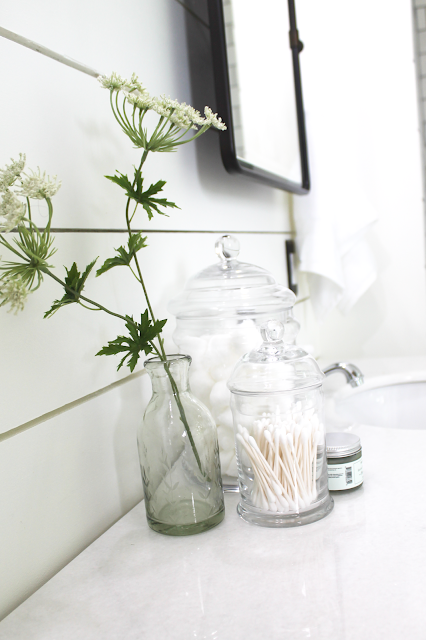 I've never been a huge fan of medicine cabinets, and I love how simple just plain 'ole vanity mirrors look. I originally wanted large oval chrome mirrors, but after installing the pivot vintage mirrors in our guest bath, I'm thinking I want those in chrome for this room. 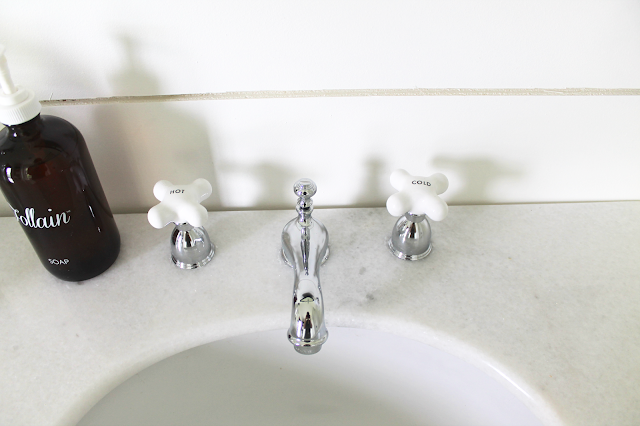 - Cross-style and porcelain-handled sink faucets. 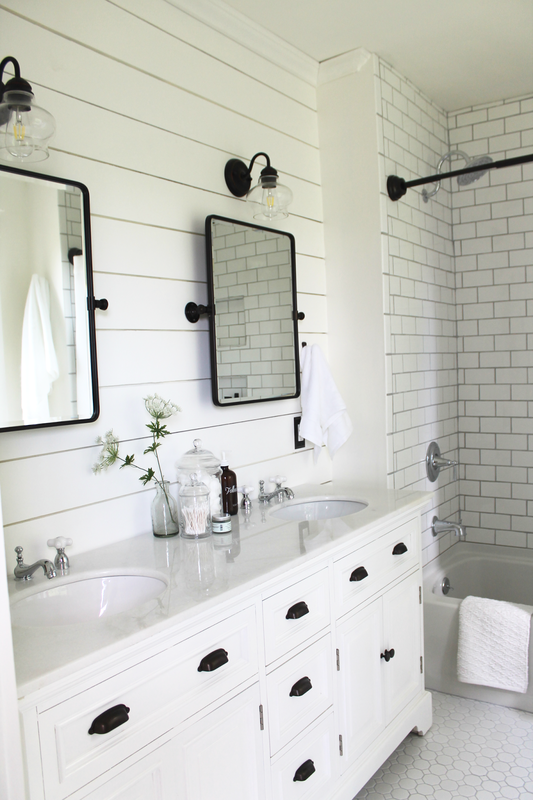 It's a strong possibility we could end up with the same sink faucets that we used in our guest bath. 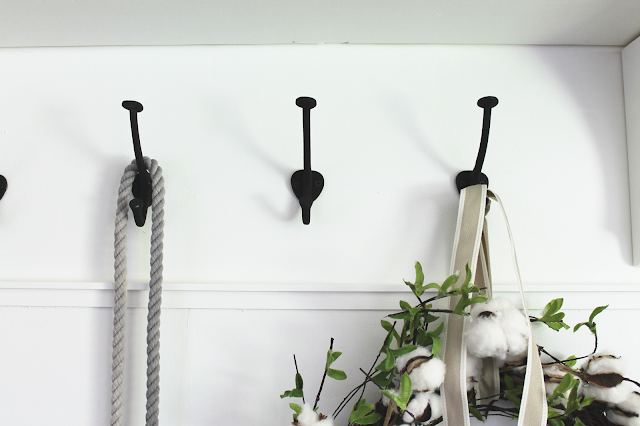 I'm contemplating a victorian or goose neck spout with the same handles, but I'm worried it'll look too formal. - Vintage wooden stool of some sort to sit next to the tub. 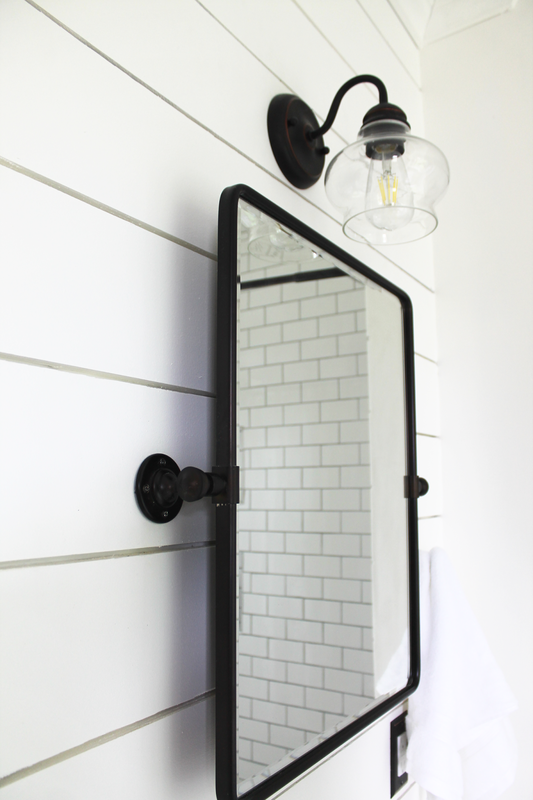 - Sconces on vanity mirror wall for light. I'm 90% sure we'll be using the ones pictured above. Josh loves them and they were one of my front-runners. I think they add the right amount of seaside without being obvious. 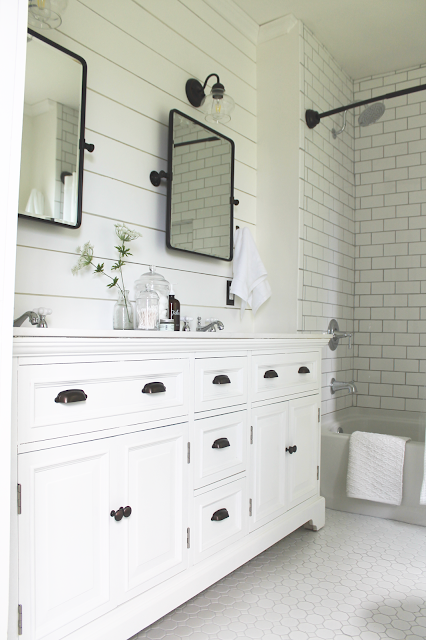 - Gray towels to break up the white and add a teensy bit of a coastal color palette. - I really want to add some natural or stained wood elements somewhere, and I'm playing with the idea of open shelving above the toilet or on a wall somewhere. I'm still unsure about this. I cannot ... I repeat ... canNOT wait to start this room. It'll be a long, tedious process, but we've done it before, and I know we can do it again. 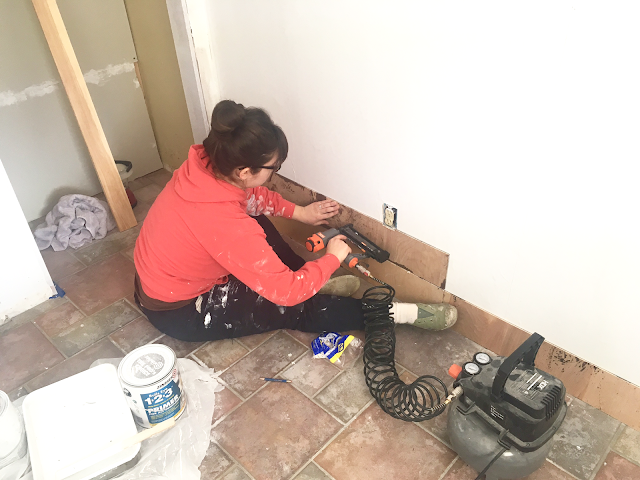 We learned so much from doing the other bathroom that we think this one will take less time because the room is already framed out, and we can jump right into drywall/cement board/tiling. But, famous last words, right? I'm guessing it'll be done by the end of Summer 2018. 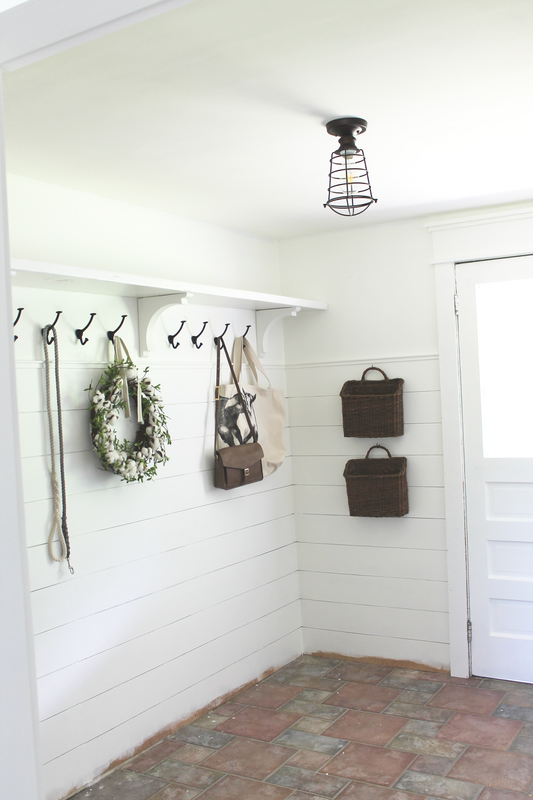 This past Winter, I started to renovate our mudroom, and talked about the reasons why here. It was kind of a casual process - this Winter I lacked energy more so than usual (I blame all the amazing snow we had), so I was a bit of sloth when it came to working on the house at all. I kind of did work when I felt like it, and would even take two weeks off at a time if I didn't feel like chipping away at it. But now, I'm happy to report Phase 1 is done. In total, they'll be three Phases, so while it's nice to have this done, we still have two more to go. 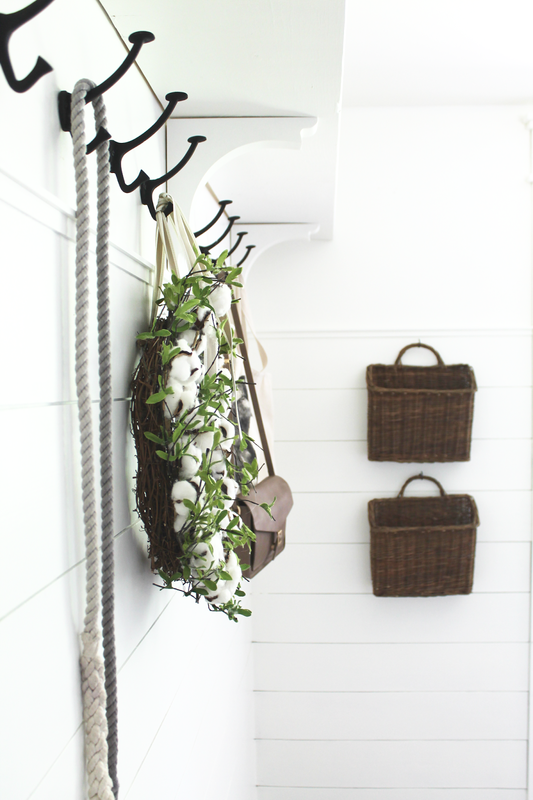 Our mudroom is a central space for both of us. Even though we have two entrances to the house, we pretty much always go in and out of this one. I had started to fix up this room shortly after we moved in, but I just couldn't quite grasp how we really needed to use the space. So I let the project go, knowing I'd eventually come back to it. 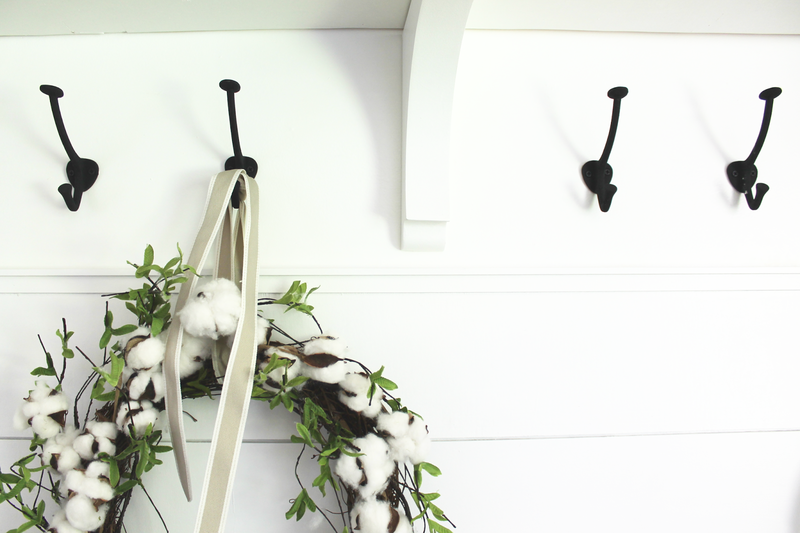 I had started with a coat of beige paint, and a new coat rack and even then, it didn't feel right. And after about another year of using the room every day, it just clicked and I knew what we needed to do to make it functional and also, fit in with the rest of the house. Bad quality iPhone Pano picture, but you get the idea. The biggest change I wanted to make was the flow. I never liked how we hung our coats on a rack on the wall you see right when you walk in. It makes the space feel smaller, and the actual logistics of getting in and out more out of sync than they needed to be. So we kept that wall clear of any storage, and pushed all storage over to the other wall, which allowed more breathing room. We started by trying to remove the wallpaper on the bottom half of the walls. And it was IMPOSSIBLE. Like, legitimately impossible. We tried everything, and this stuff would not budge. The only way we could remove it was by ripping the heck out of the drywall. We debated this a ton, and decided that since we were planking that part of the wall anyway, we'd just leave it, and cover it up. Which I know, is like a huge renovating faux pas. I'm almost ashamed to even be admitting we did that. BUT, it had to be done since we didn't feel it was necessary to re-drywall the entire room just to get rid of some wallpaper. So yeah, we did it. No regrets. Once that decision was made, we started to remove the old trim and the closet door, and drywalled over the ceiling tiles. That made the biggest difference. Having a nice, smooth ceiling helped to open up the space a lot, and I started to wish we had done this sooner. This was very not fun. I came in to prime the walls and Josh did the ceiling (since, you know, he has the height advantage), and then we started to install a faux shiplap three quarters of the way up all the walls. I was torn on how far up to go (I debated this for like, months - I know), but something about the aesthetic of the planks going almost all the way up was appealing to both of us, so we just went for it. 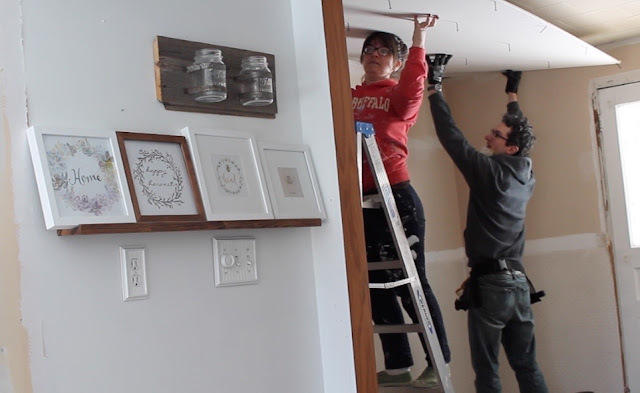 Thankfully, we were able to re-use the reject plywood planks from our first (failed) kitchen ceiling attempt, so we ended up saving about $100 or so, which was nice. Me, before reality sunk in that I would not be finishing this wall. I tried for a few days, though. A for Effort. Installing the planks, we thought, would be simple. I actually jumped right in and started to install the first row, thinking I could totally do this myself. Wrong. But also, I'm the type of person who, if it isn't 110% perfect, I can't move on until it is. Here's the thing: the room wasn't level (surprise!). I would start a row, and keep checking each plank with a level, and everything would be going great until suddenly, one plank wasn't level. And I couldn't figure out why. I would take them all out, start over again, adjusting the bottom row, trying new things, and it never came out right. Josh stepped in, and did the whole room in like an hour. I asked how he did it, and he just said, "you have to let go of the fact that each plank will never line up perfectly with the next." He's able to let go of these things, whereas I can't. But, it got done. I was just mad I couldn't do it myself. But anyway, moving on. Once they were up, I had to prime and paint those. I used, you guessed it, Simply White by Benjamin Moore. Then we installed some trim to join the wall with the new planks, using caulk to hide any seams, and then built a new shelf to go along the back wall. 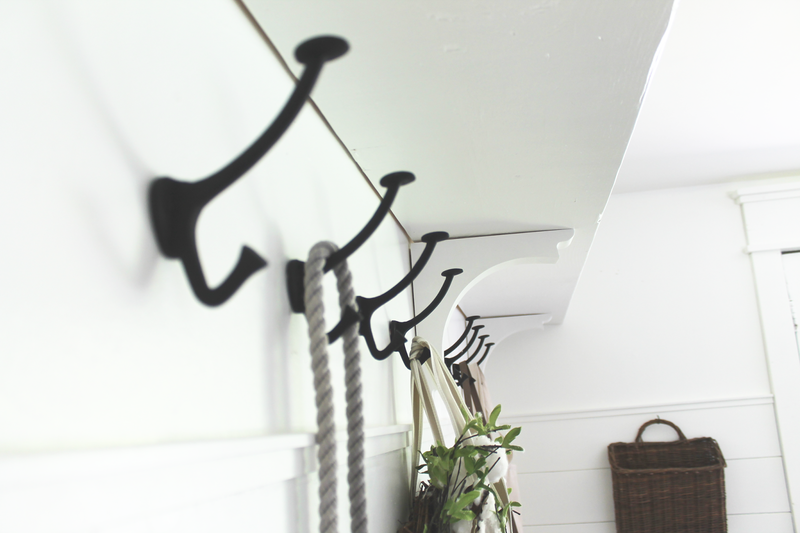 Underneath, we put in some new cast iron coat hooks that had more of a farmhouse feel to them. As a side note, we just bought this leash for Betty on Etsy, and I'm kind of in love with it. See below for link to the shop. There was just no way I wasn't putting a wreath up somewhere in this room. 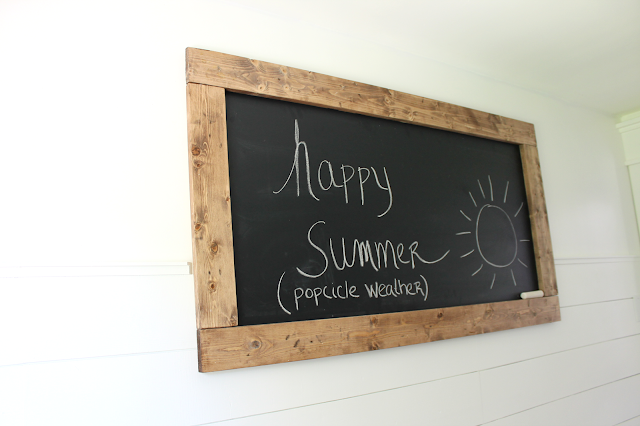 We also really, really wanted a chalkboard in this room. I honestly couldn't tell you exactly why, but whenever we both talked about the idea, we were so excited about it and just needed to make it happen. You'd think we were a couple of 8 year olds or something. We bought a good-sized piece of chalkboard from Lowes, and then cut and stained some 1x4's as a frame, and hung it on the wall opposite the new shelf. This is one of the many moments I wish I didn't have the penmanship of a serial killer. The cage light fixture we've had for a while, actually. It was probably one of the first lights we bought for the house (the existing one was red or pink or something and shaped like a flower, so it had to go). 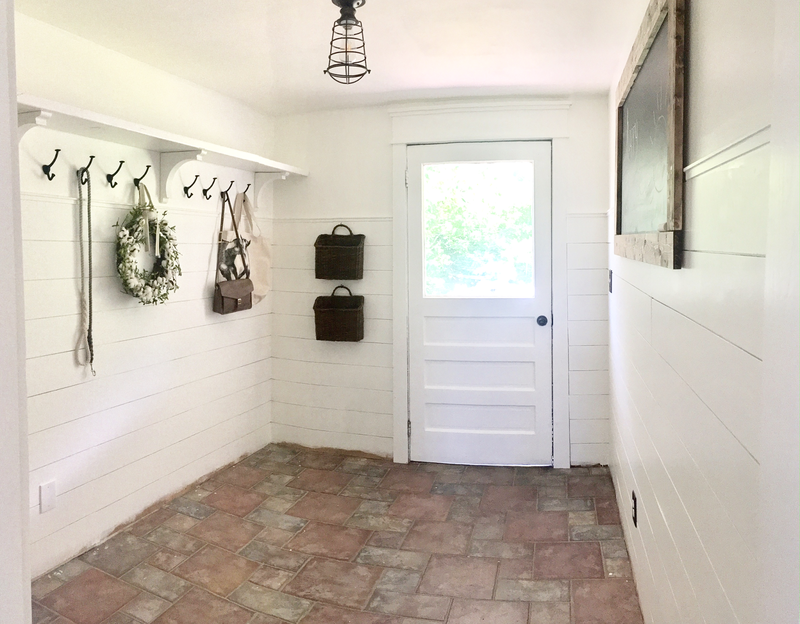 We wanted something basic and almost industrial since it's just a mudroom, and I'm thankful it still works with the design after two years of having it. 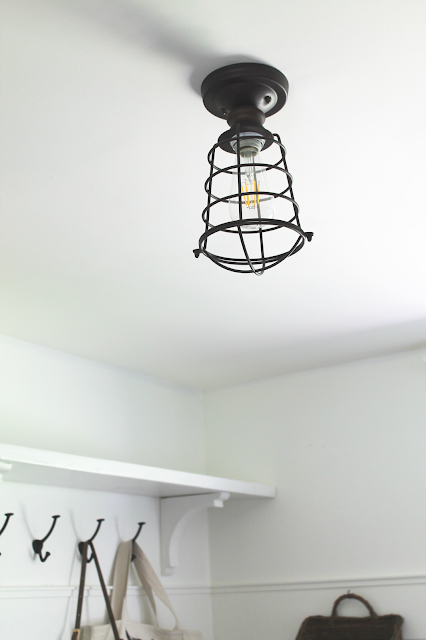 It's funny because we had a friend over that's been to our house several time since we've moved in, and during his last visit a few months back when we had just finished painting the new drywall ceiling in here, he said, "Oooo, I love this light! Is that new?" 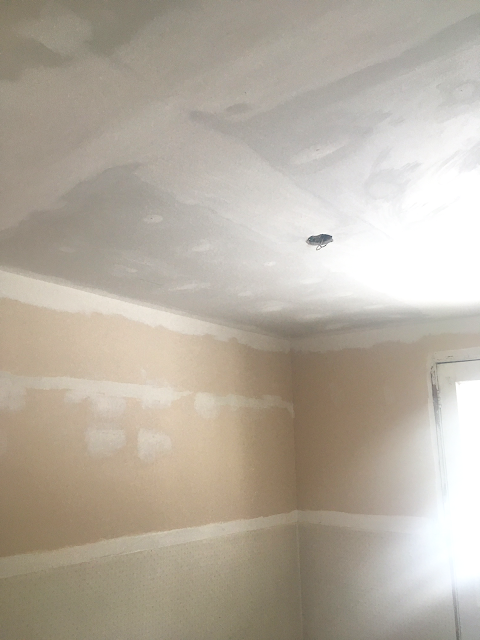 We laughed, and were like, "No, we've had that since your first visit here, but it just looks better now with the white ceiling." 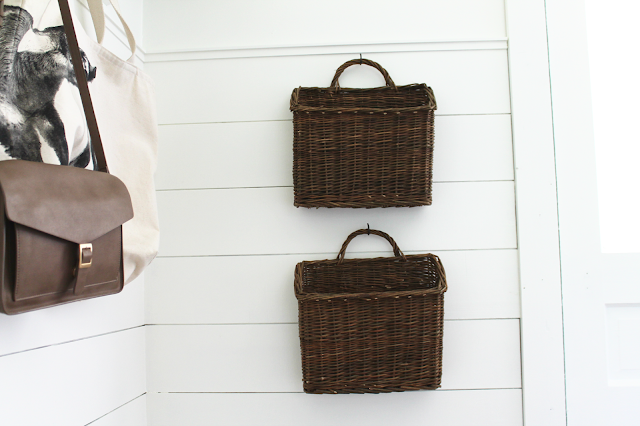 Finally, we hung some baskets on the wall that I found on eBay to use for mail. We have a serious organizational problem with mail - it ends up all over the house because while renovating every room in this house, we never thought to pick a designated area for it. We got two baskets - one for magazines and one for regular mail. 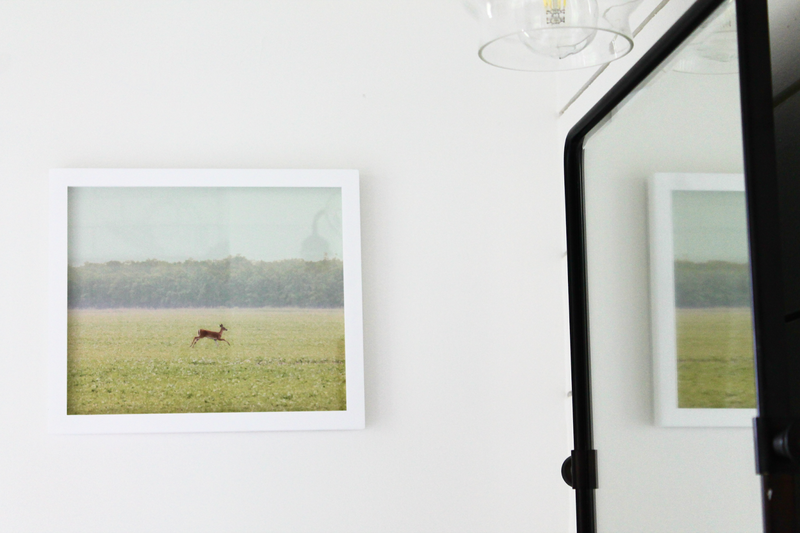 And I love having it up on the walls so it's not cluttering up our dining room table, or coffee table, or kitchen island, or wherever else it was ending up in the house. And that completes Phase 1! 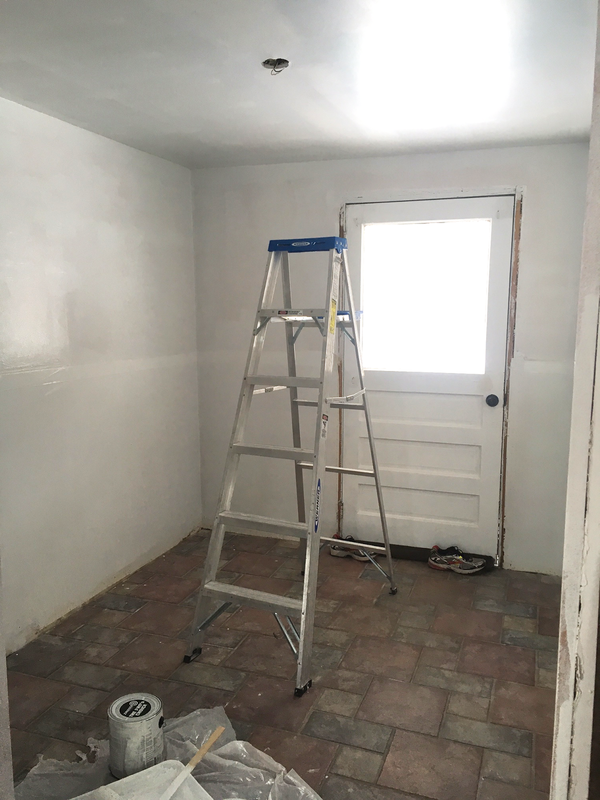 There still a lot to do in here, and you can see that there's paint on the floor, that I didn't photograph the closet area and there's a lack of floor and ceiling trim. And that's because since it's an on-going project. We didn't want to put a lot of effort into clean-up since we'll still be cutting wood for trim and building bench seating. Phase 2 will be building the storage bench that will go underneath the shelf and coat hooks. We've already planned out the design, and recently bought the lumber for the frame. This will be Josh's first carpentry project, and I'm so excited to see how it turns out in the end. Once that's assembled and painted, we'll finish off the trim on the floor and ceiling. The final phase, Phase 3, will be re-doing the closet. We have to do some demolition work and drywalling in here. Right now the door is down, and I've gone ahead and primed and painted it. But we can't put it back up until the closet is done for a variety of reasons. So right now, it's an open storage space for lumber, tools and a lot of random crap. For now, though, we've already accomplished making this room way more functional than it ever was, just by using the space more wisely. 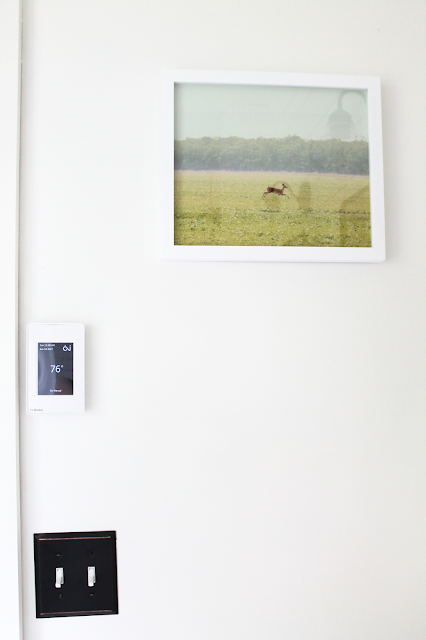 And walking into a bright, white room after being at work all day is soothing, and totally makes me smile. 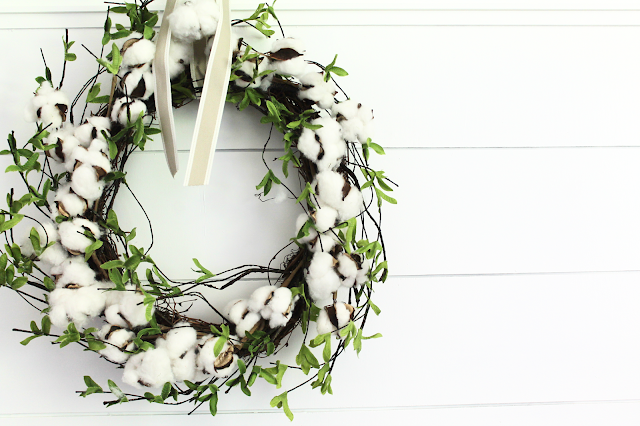 Cotton and greenery wreath: Afloral.com, no longer available, sadly. Since discovering Fixer Upper a while back, Josh and I like to refer to each other as Chip & Joanna. Josh loves demo day and the actual construction work behind a project. But I'm all about the design and the details, which Josh usually just leaves up to me. It works perfectly. Bad quality iPhone Pano photo so you can see what I see when you walk in. Mmmkay, now I can elaborate on the details in this space. The sink console: It's from Home Decorator's Collection, and it's the Sadie console. We went back and forth on deciding between a single and double vanity a lot. If we had done a single vanity, we would have been able to install an entrance to this bathroom from not only the hallway, but also the guest room, creating a little guest suite of sorts. But most people told us it was so much better to install a double vanity and sacrifice the double entrance. Finally, my mom, who's been a realtor for over 20 years, said this would be better for resale value. Not that we're looking to sell anytime soon, but it pretty much sealed the double vanity deal for us. 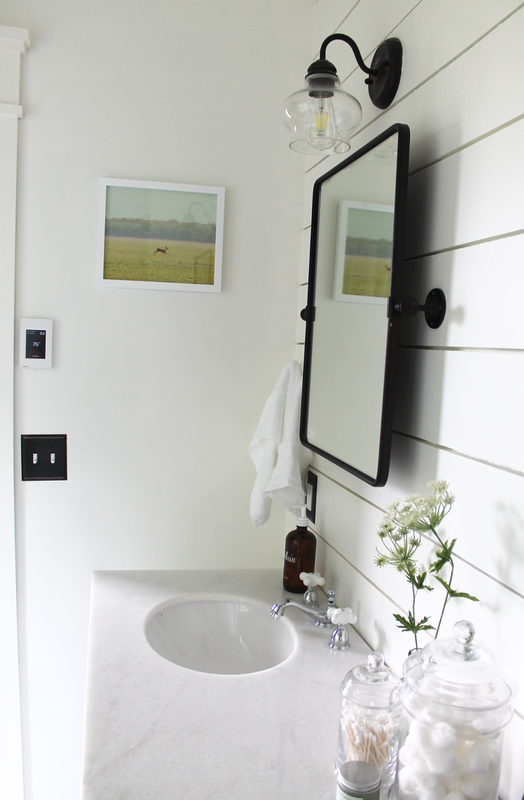 Plus, with it being a really small bathroom, the extra counter square footage also allows the space to be used wisely. 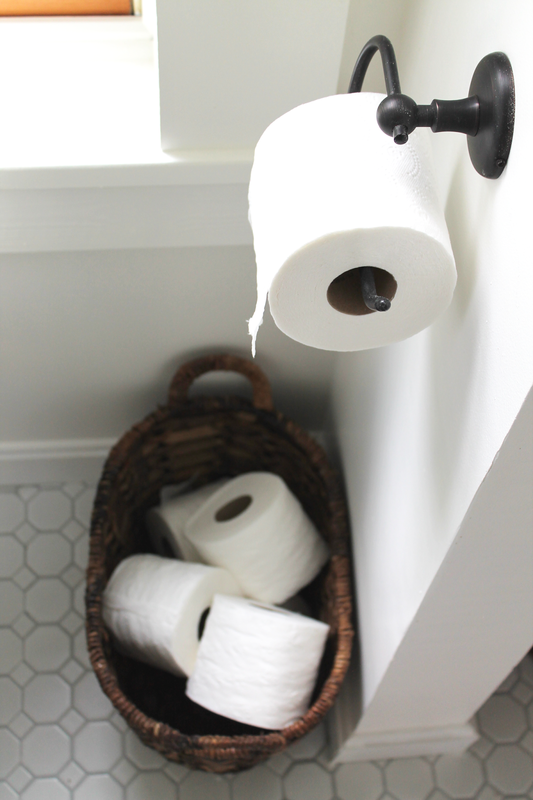 I specifically chose one that had a lot of storage so while the bathroom is small, there's plenty of places to hide things without it looking cluttered. As I mentioned in the past post, this vanity, of course, didn't come in white. 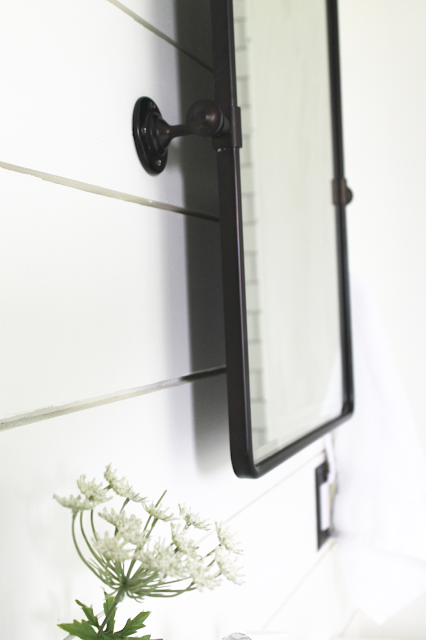 But, it was also the only vanity I found that fit with the style I was going for, had the storage space and was also within our budget. So, we ordered it in one of the colors it came in that happened to be at a clearance price. So we got it, and painted it white. Side note: It was clearance when we bought it last fall, but it has since gone back to the original price, so I'm not sure what happened. I know the Home Decorator's brand website no longer exists, and is sold exclusively at Home Depot now, so maybe that's it. We ordered direct from the Home Decorator's website when it was up and running. It didn't come with faucets, so we had to purchase those separately, which I actually kind of prefer because, as with everything in life, I'm picky about faucets. 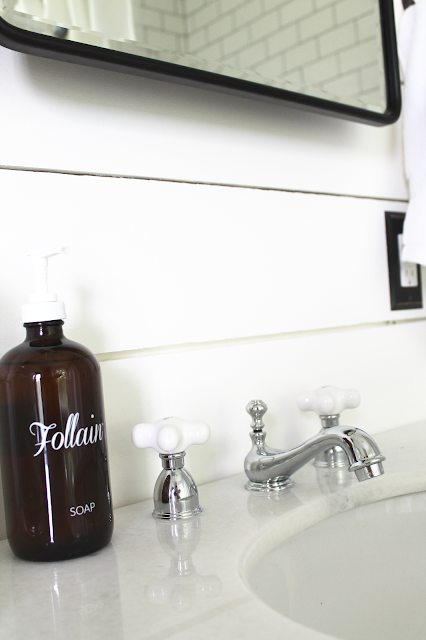 I love Signature Hardware's website for these kinds of things, and found the perfect faucet that I had been envisioning in this bathroom. 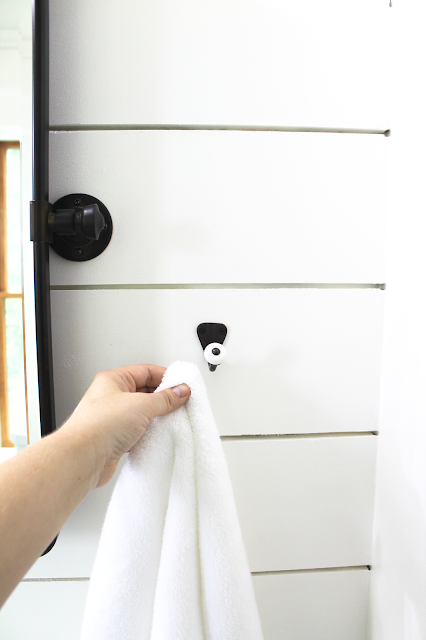 I have a thing for cross-style faucet handles, and found a simple faucet neck I liked, and ended up getting these during a sale the website was running. Because we did some bronze accents, I considered getting bronze faucets, but I'm personally not a huge fan of them. I love them in other people's home, but they weren't something I wanted in this bathroom. I was worried the chrome sink faucets and shower head would look funny if we had other bronze fixtures in the room, but it actually totally looks fine (most people wouldn't even notice). Technically, I suppose it's a design faux-pas, but it doesn't bother either of us. The things you over-think while renovating. 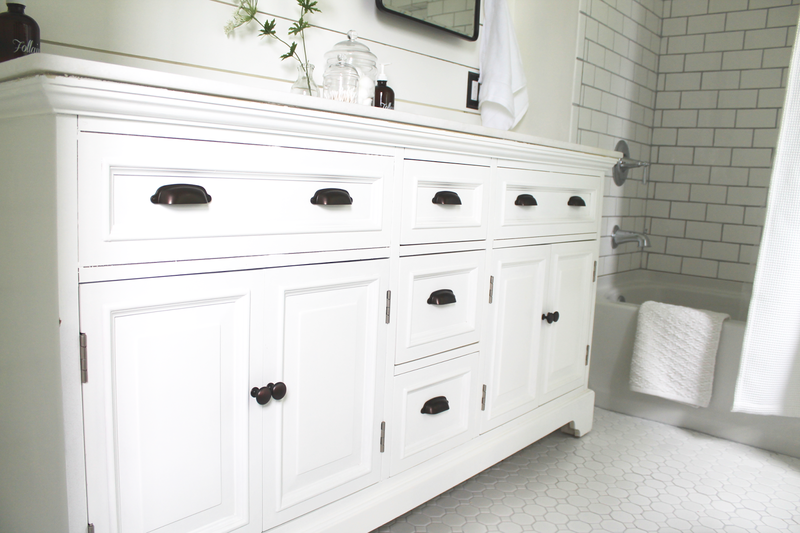 After painting the vanity white, I really wanted to swap out the satin nickel hardware it came with for bronze. Not even to match the other fixtures, but just because I felt like it would add a lot more visual interest to it. Also, the hardware it came with has a slightly more modern look to it, which I wasn't particularly fond of. So, I stored the original hardware in case I ever changed my mind, and ordered new bronze drawer pulls and knobs for the console. And oh.my.gosh it made such a huge difference. These definitely gave it a bit more of a farmhouse feel and it started to look slightly less manufactured, and a teensy bit more custom. We introduced the bronze tones with the pivot wall mirrors. 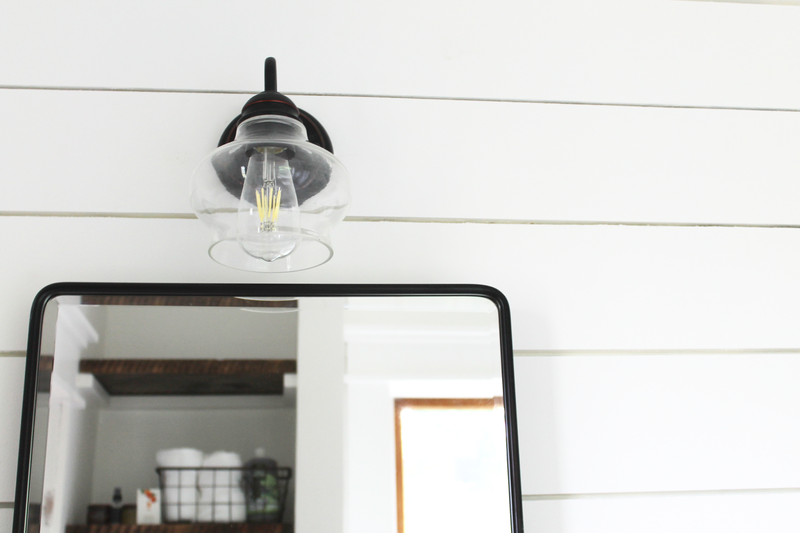 I had originally envisioned one long mirror with a reclaimed wood-type frame, but had the hardest time finding one that fit our budget. I thought about making one myself, but I just didn't have it in me for that kind of DIY project this time around. 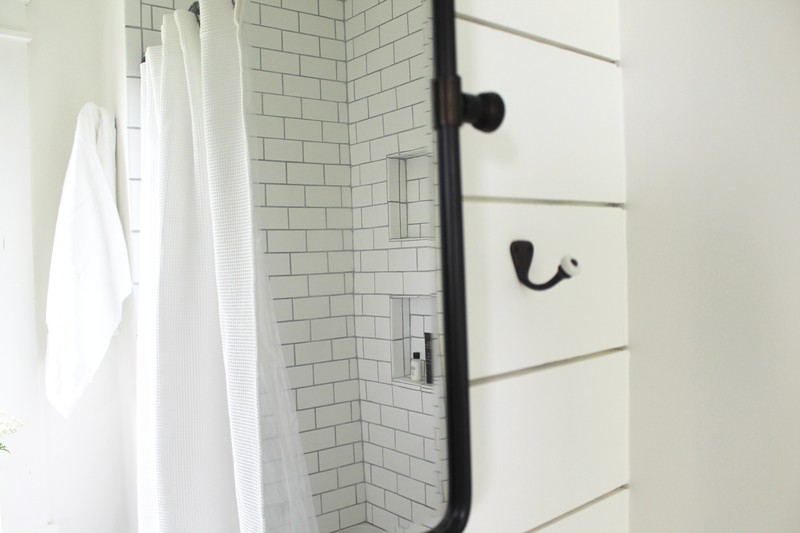 In the end, though, I think I may actually prefer the mirrors we got, so it worked out. Above the mirrors we decided to go with single sconces instead of a ceiling light. I actually had these picked out for probably nine months and they ended up being the last thing I bought right as we were wrapping up the last few details (I waited so long for the website to do a sale, but they never did). I wanted to make sure the light fixtures we got added something to the space without being too overwhelming, and the bronze wall plate with the glass cloche was perfect. And they weren't even that expensive, surprisingly. The tub/shower combination we kept really simple. White tub, white subway tile, white shower curtain with a curved, bronze rod. 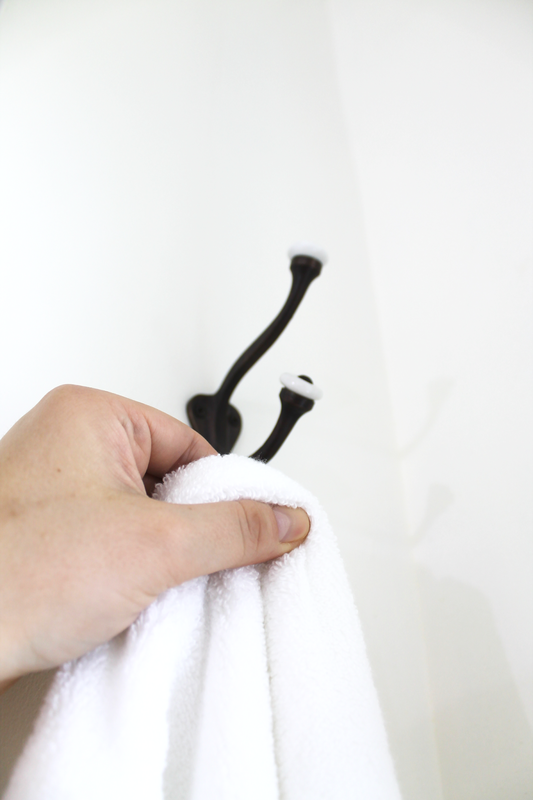 We both really wanted shower niches, as opposed to an over-the-shower-head hanging caddy. 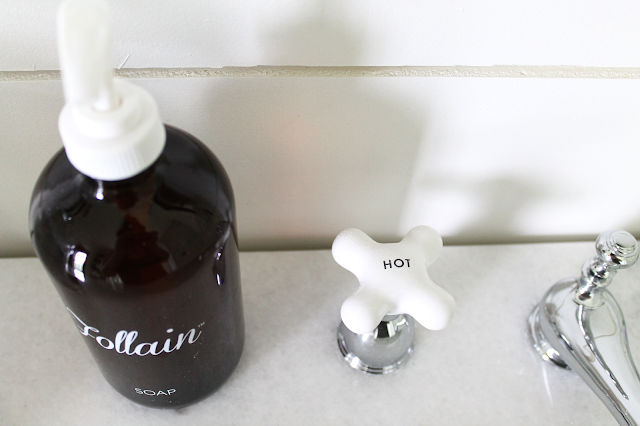 So we built out two of them to hold soaps and shampoo bottles. 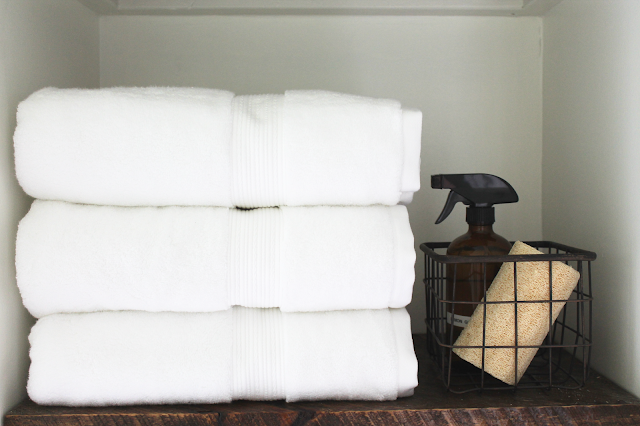 We debated putting in the linen closet because the room is so tiny as it is, but we decided that for the amount of space it would actually take up vs. the extra storage it would provide for towels and such, it was so worth it. 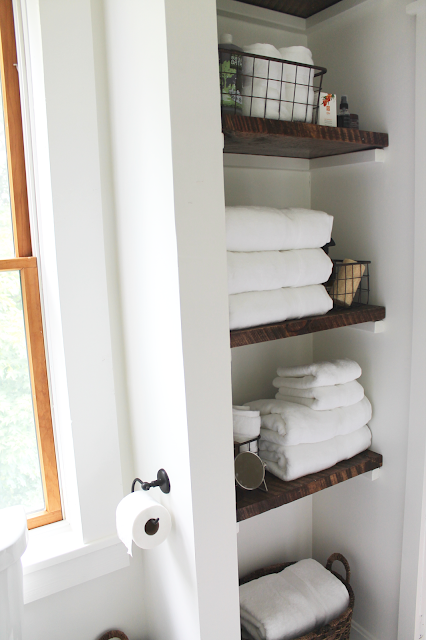 From the beginning, I envisioned a white linen closet with rustic wood, open shelving to display our towels and extra toiletries for our guests. You can't see it if the door is open, which is perfectly fine since I know it'll never look this organized all the time, but it's so nice to have. The vanity holds quite a bit, but having this is amazing. The one major design detail I struggled with is the window. We both know that having a window above the toilet is weird. There was really no way around it without re-structuring the entire backside of the house, though. So we left it, and I plan to look into roman shades for it in the future. For now, though, I just can't decide if we even need a shade, so that decision will probably happen a year or so from now. No one lives near us, so privacy isn't exactly a huge concern. 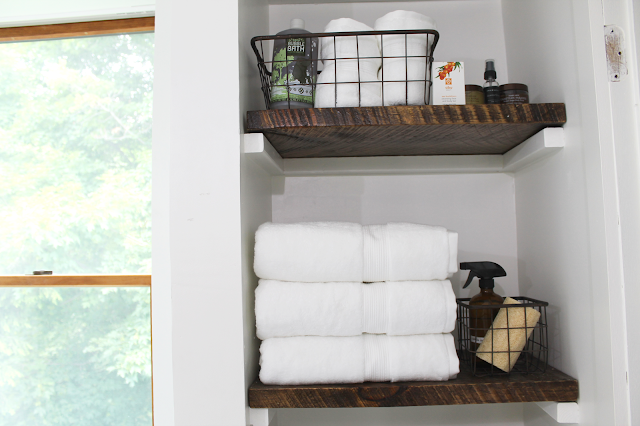 On one of the walls next to the sink, I, for some reason, was dead set on having hanging wire baskets with towels, bath accessories and knick knacks. I was really passionate about it, and to this day, I can't tell you why. 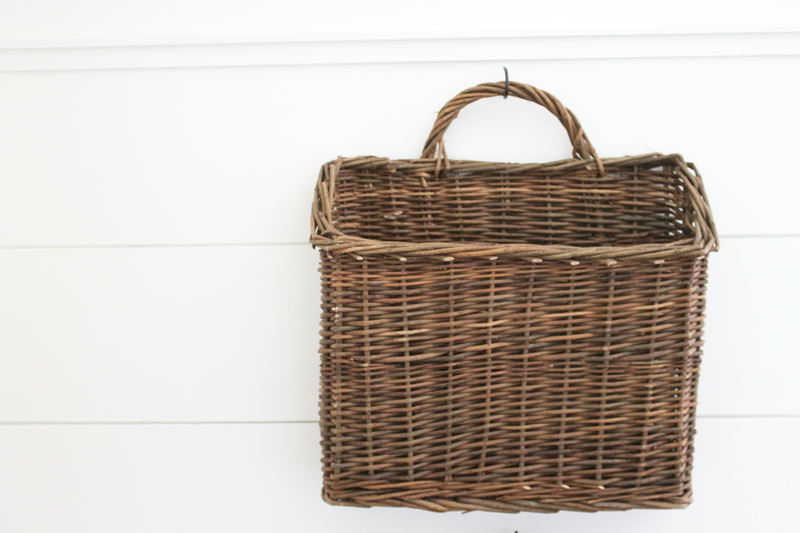 I actually bought the baskets from a store we don't even have here locally, only to change my mind as soon as I held them up on the wall. 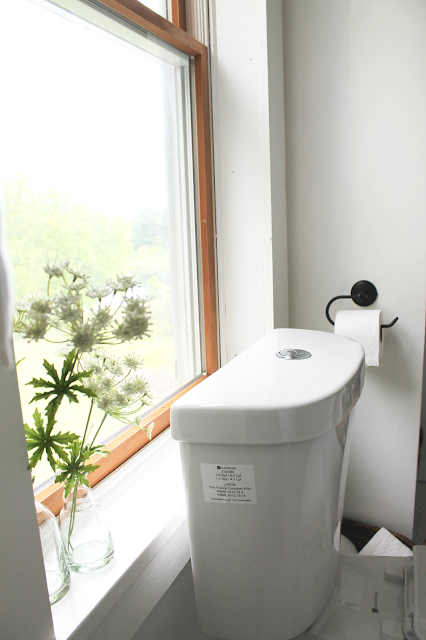 It made the bathroom look cluttery, and I was kind of disappointed that they didn't work out. But one design element I also really wanted was able to stay. I wanted to have some form of happy, nature-inspired artwork in here, and framed this photo from Etsy of a deer leaping through a meadow. 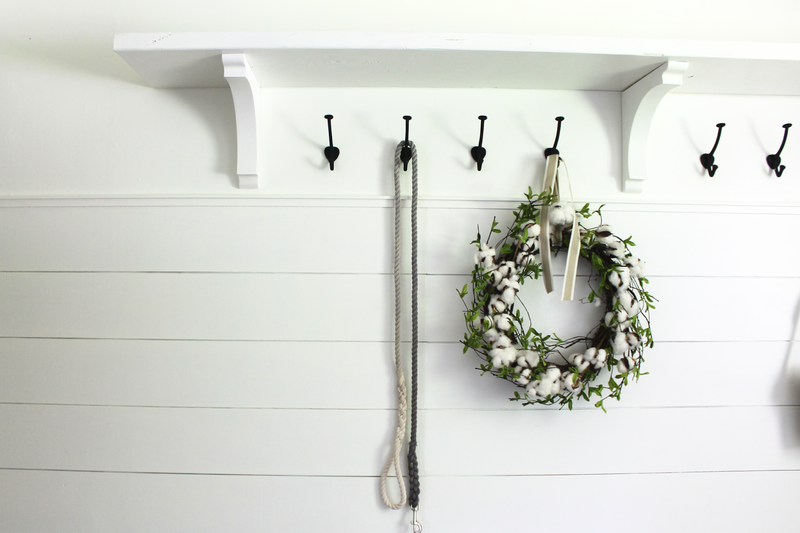 It makes me smile, and I like how it adds a sprinkle of color that ties into the faux greenery I used in here. Speaking of clutter, I wanted to make sure that the sink console always looked clear, free of too much stuff and very soothing to look at. I didn't want stands with hand towels on the sink top, but you know, you need access to hand towels in a bathroom. So, we both liked the idea of having hooks on the walls for towels. I loved these bronze and porcelain hooks, also from Signature Hardware, because they had a vintage feel to them while still fitting with the style of the room. We put two small ones on each side of the mirrors, one large one on the shower wall, and we'll also be putting two more on the back of the door (once the door is done). Finally, the door. So, we don't have a door at the moment. 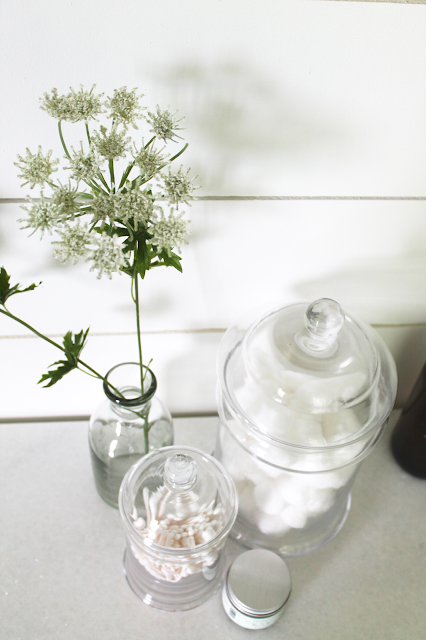 Even the simplest of projects never goes according to plan, right? 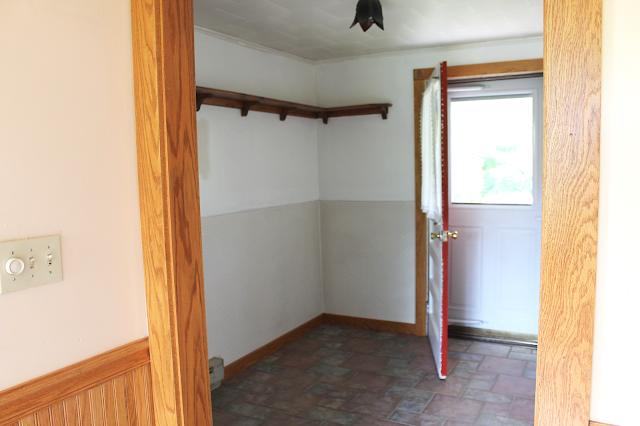 But, it's the exact same door, stain and knob we used in our kitchen (which you can see here). So it'll obviously be getting the door in the next few weeks or so, and then it'll really be done. And that's it! Phew. It was so much work, and our biggest project to date. I honestly think it will be the biggest project we ever do. 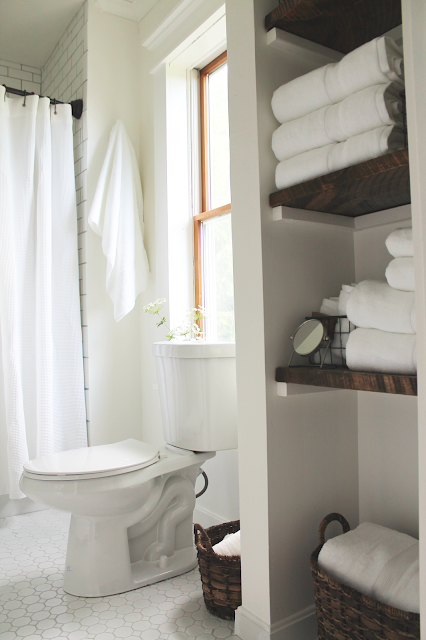 Our master bath renovation will be a pretty big project as well because it will entail ripping everything down to the studs and installing a plumbing line for a freestanding pedestal tub. But everything else will be cosmetic. I'm really proud of Josh for everything he took on with this project. He powered through with cracked knuckles, blisters, a torn ligament in his knee, pure exhaustion and talked me through meltdowns over the doorway and window molding, just to get this done as quickly as he could, while doing everything right. He's just awesome. More than awesome. There are no words. *I work for the Williams-Sonoma brand and received an employee discount on these items.